There is no finer way to spend a day in the cold winter weather, than out in that very same cold winter weather. That is if you’re a landscape photographer looking for some striking images. Probably not so advisable if you’re trying to make bread, or raise meerkats, or even sunbathe. But if decent photos are what you’re after, then it’s time to wrap up and get chilly. As every right thinking person knows, a snowy landscape is a thing of beauty. 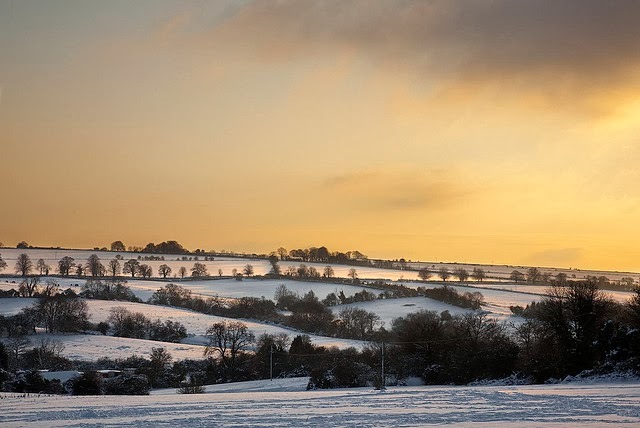 It doesn’t happen very often though, as despite our sometimes glum weather, the number of days per year we see snow, are quite minimal, particularly in the south of the country. Which makes a snow covered scene something special. For one thing the light is rarely harsh, thanks to the continuous low angle of the sun throughout the day. Which isn’t to say that sunrise and sunset aren’t still the best times to photograph, that doesn’t change. But it does mean that depending on the quality of light, i.e. what the weather is doing, decent shots can be taken all day long, albeit on days that aren’t particularly long. Just remember to wrap up warm before heading out, it’s a great feeling to relax in a well heated home/pub/hospital after a day out shooting, but to my mind that feeling doesn’t really make up for hours and hours of freezing your nuts off. So decent gloves, thermal underclothes and a bloody big coat are your best friends on days like these, second only to a flask of whisky or gin, or tea if you absolutely must. To get everyone in the mood for the weather (hopefully) to come, here are a few shots from last year’s grand display. As with all sunrise shots you need to get there nice and early to scope out a decent composition, luckily at this time of year, early isn’t really early, as the sun doesn’t get above the horizon until about 8am. 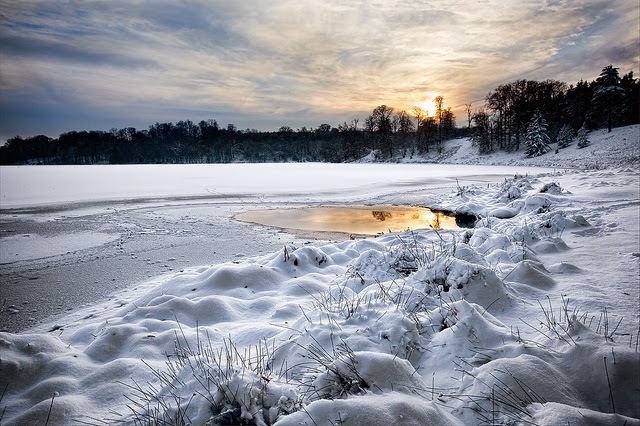 The photo below, taken by the lake in Blenheim Park, entailed me getting to the location at about 7.15. With torch in one hand, and flask in the other, I stumbled about looking for something worthwhile, and came across this break in the frozen lake. Because I knew which direction the sun would appear I positioned myself so the water was between myself and the rising sun, which would give me some nice reflections. I placed the camera low, to take advantage of the textured snow that lined the lake shore, to give a bit of foreground interest and waited for the sun to do what it does best. The resulting image had a pronounced blue cast to it, thanks to the hour of the day, and the snow reflecting so much of the sky. But this was quickly removed in post, although I left a bit of it behind, as it looked unnatural to remove it completely. 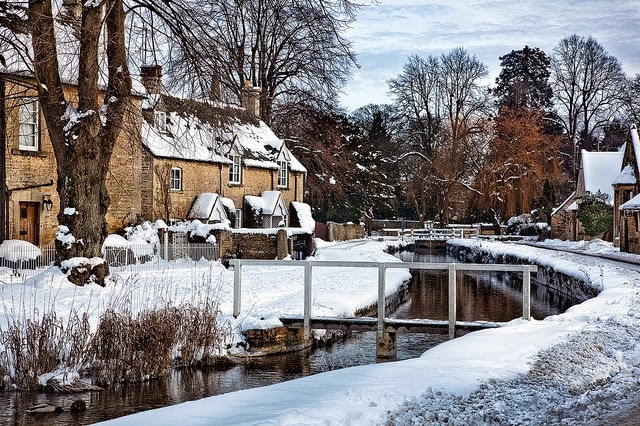 Later on that morning I headed to Lower Slaughter, a rather fetching little Cotswold village, to get a few shots. By now the light was a little flat, but even in weather like this, there was no reason to put down the camera to begin drinking in earnest just yet. This is an attractive village anyway, but with a liberal dose of snow, it is further improved. To get the sweep of the stream that runs through the village I had to stand in the middle of the road, which wasn’t too deadly a feat. Considering that the weight of traffic equalled the mass of a pint-sized plum pudding, I wasn’t in great danger, but I took a quick snifter of Christmas cheer to steady the old nerves anyway. You can never be too careful when negotiating carriageways. Unfortunately I couldn’t get the angle I wanted on the stream and completely exclude the edge of the road as well, which was looking a bit of a mess, what with the churned up snow. So I had to make a bit of a compromise with the bottom right of the image. With the day cracking on a pace I was soon moving on to pastures new, and I found myself at Ditchley Woods, where a young stand of trees had caught my wandering eye. 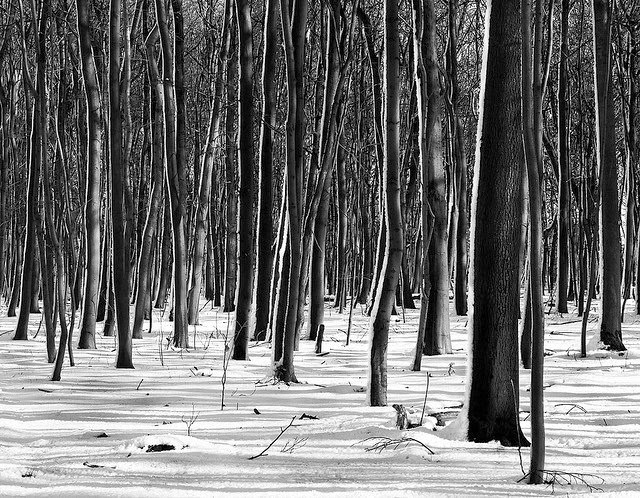 I lined myself up so I could capture the trees with the low sun catching their slender trunks and casting shadows onto the unspoilt carpet of snow beneath. After taking on more fortification against the piercing chill, I proceeded to use the tripod to steady myself, while I fired off shots at random, the clicking of shutter swallowed up by the muffled silence of a deserted woodland at rest, beneath its frosty duvet. After roaring my appreciation to the forest creatures and hugging the nearest tree, I was soon careening past these young striplings to an open field, where another potential scene had me loudly toasting the clouds for dropping their frigid cargo so perfectly. Again, with my trusty tripod, a photographer’s best friend if ever there was one, holding me stable, I composed for the scene in front of me. I tried to keep it as minimal as possible, just a few strands of grass poking through the soft, undulating cover, and a selection of shadows from the nearby trees providing a striped symphony of shade against the brilliant white. 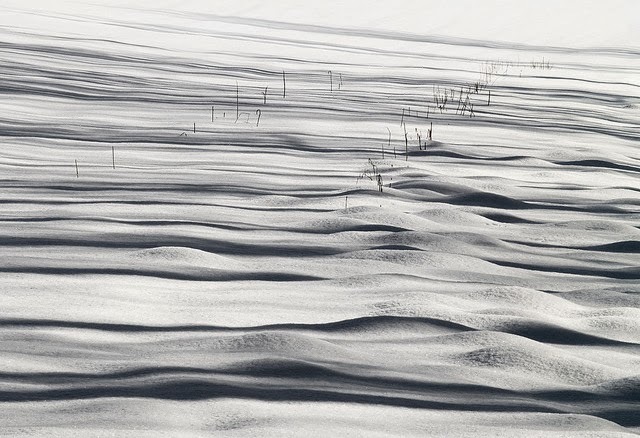 Compositions like these in the natural world are only possible with the addition of snow, so they should be searched for and captured with as much tenacity as the larger landscape views. So after telling my tripod it was my best friend, many times, and diligently buttressing myself against the creeping cold some more, I took flight. I somehow found myself on the outskirts of Chipping Norton, setting up my equipment in readiness for sunset. And it wasn’t long before it started to happen. The light was soon turning to a burnished orange, and thanks to the reflective nature of the snow, the ground too was taking on a sympathetic hue. This is one of the reasons that sunsets can be so special in these conditions, the landscape, more than any other time of the year, shimmers with the iridescent warmth supplied by the setting sun like no other season. I for one was glad I’d managed to capture such a distinctive sight, and as I raised a celebratory flask to our wonderful weather, I slowly, and, I like to think, with a certain amount of elegance, tumbled to the ground with a satisfied smile. Thanks Jim. Hope all is well with you.